What should be here is a recipe similar to Liv Life’s PBJ Banana Waffle Sandwiches, except that at this point in MoFo, I’m kinda done with PB & J sandwich iterations. First was the mile-high French Toast Peanut Butter & Sandwiches back on Day 2, and then on Day 10, I served up a gooey mess called a Grilled PB & J. So instead of more sandwiches, I created a crispy peanut butter and banana waffle – since you know I never tire of waffles – topped with a decadent blueberry sauce. (Which also doubles as a delicious smoothie add-in.) Liv’s recipe was listed at Number 17 on Buzzfeed’s 29 Ways to Honor the Glory of Peanut Butter and Jelly. If waffles make you happy and peanut butter get your heart beating faster, then this is the combination to make your day! Top these crispy, tender waffles with fruity Blueberry-Macadamia Nut Sauce or go with the classic, pure maple syrup. Preheat the oven to 200-degrees and get the waffle iron heating as well. Remember to put your breakfast plates in the oven so that they keep those waffles warm as you eat. In a large bowl, whisk together the flours, stevia, salt, baking powder, and baking soda. Set aside. In another bowl, mash the bananas and add the water, flaxseed meal mixture, and peanut butter and stir to combine. Pour this mixture into the flour mixture and stir well. A few lumps are okay. When the waffle iron is ready, give it a light spray with oil and ladle in some waffle batter. The amount will depend on the size of your iron. Cook for about 4 minutes or until the waffle is crispy and brown. Transfer the waffle to the rack in your oven and proceed with the remaining batter. 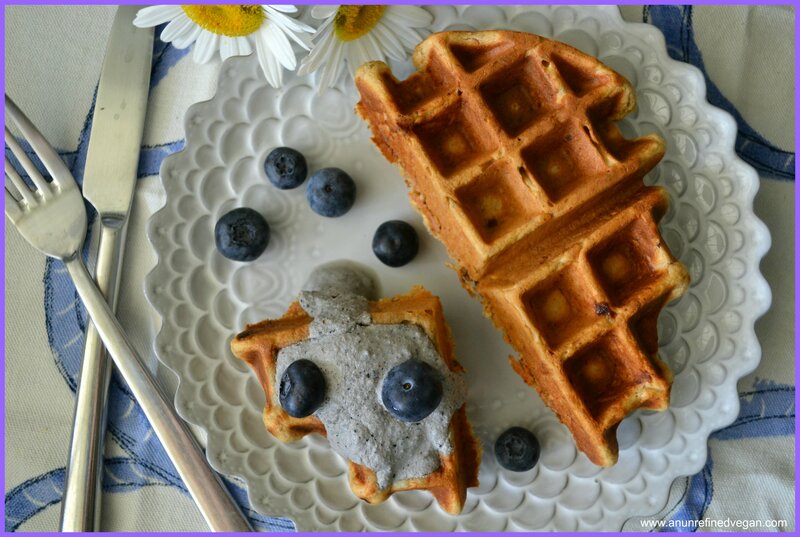 Serve waffles with Blueberry Macadamia Nut Sauce (recipe below) or with your usual fixings. Yield depends on type and size of your waffle iron. The perfect complement to crispy, tender Peanut Butter Banana Waffles. Place all ingredients in a blender or food process and blend until very smooth. Add more milk (or water) to reach desired consistency. This sauce will thicken over time. Your waffles always look so good! Macadamia nut sauce sounds amazing! Thanks for sharing your fantasy with me, Celeste. It means a lot that you like my photos. I still feel insecure about them. 🙂 (really BIG smile). Baking, cooking, taking some photos – we’d have a blast! The sauce made a great smoothie, too :-)! That waffle, looks so perfect. The shape, the color, the texture. I NEED A WAFFLE MAKER! You do, you do! Waffle makers for all of my friends! If it’s wrong, I don’t wanna be right :-)! It works (and I was tired of using cashews)! Now that is a gorgeous looking and sounding waffle! You make me want to start up my hunt for a waffle iron again! Do you like yours? I really want one that doesn’t have a teflon coating and finding that kind of impossible to track down. I do like mine, but it’s teflon-coated. Hmmm, hadn’t thought about that before. I got rid of my teflon-coated pans… Good luck in the search and let me know if you find one that’s not coated! Those look so good!!! The blueberry macadamia sauce sounds amazing!!! Mmmmm. It’s a stand-alone recipe for sure! As soon as I get a waffel iron I’ll make it. Besides the blueberry macadamia sauce does look so tempting. Bravo! These look so delicious! Peanut butter in waffles? Yum! !